The Red Mason Bee is a small, common solitary Bee which nests in hollow plant stems, in holes in cliffs, and in the crumbling mortar of old buildings. 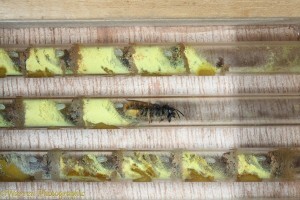 They will often use man-made solitary bee boxes. Both the Male and females hibernate over the winter in silk cocoons inside their cell, with the females positioned at the end of the chamber and the males nearer the opening. In spring (mid/late March), as temperatures rise, the smaller male bees are the first to wake from hibernation. Each then chews its way out of its cocoon and the mud sealing the entrance. Out of the chamber they feed on pollen and nectar and wait for the female Red Mason Bee to exit hibernation before they mate. Mating over, the female Bee will lay her eggs in a selected chamber and line each cell in the chamber with sufficient pollen and nectar for the larvae to feed on while it is growing. Once this task (which takes 10 to 12 weeks) is complete, the Red Mason Beess will die as the life span of an adult female and male solitary Red Mason Bee is less than 1 year. Meanwhile, during the summer the eggs inside the chambers will emerge as larvae and feed on the stored pollen until in late August–September, they spin a silken cocoon and enter the pupal stage. By early October they will become a fully-formed adult Bee inside the cocoon. The adult Bee will remain in hibernation until spring, when the cycle begins again. They vary considerably in size, appearance and where they choose to nest. Roughly 70% are called mining bees and nest in underground burrows. Bees that nest in houses are called cavity nesting bees. Do not live in colonies, produce honey or have a queen. Do not produce wax to construct the cells inside the nest instead different species use different materials to construct their cells and nests. Drink nectar directly from the flower and spend most of their time collecting pollen which is mixed with a small amount of nectar as food for their young. 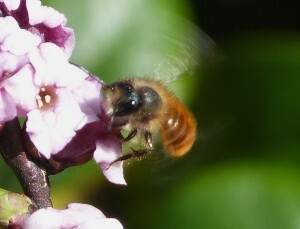 Are fantastic pollinators: a single red mason bee is equivalent to 120 worker honeybees in the pollination it provides. Provide each larvae with everything it needs but they do not tend to the young as they grow and never get to see their offspring emerge. Are non-aggressive and do not swarm.